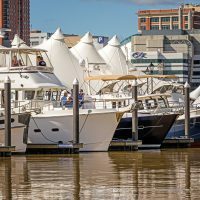 TrawlerFest moved back to the Baltimore Inner Harbor (Harbor East Marina) after several years away and the location, timing and participation was a big hit all-across the board. We had a little bit of rain showers, but for the most part the weather was ideal, and it felt like one more weekend of summer. 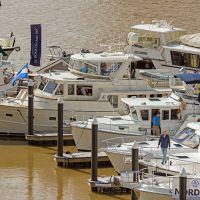 PassageMaker magazine has kept the TrawlerFest events both familiar and innovative by mixing up the locations, the seminar content and there is always a diverse blend of trawlers available to inspect. By hosting this event in three diverse geographic regions across the country and during different times of the year, there is usually one location that is the best and most convenient for travelers to attend. 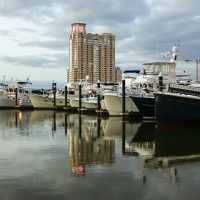 Baltimore was the last event of 2018 and three more are being planned for 2019 (FL, WA and MD). 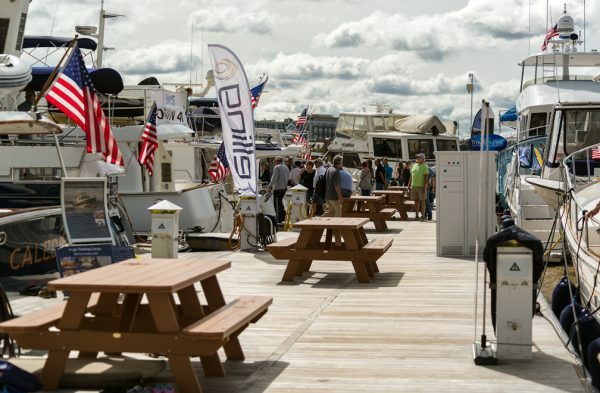 We will keep you posted when we learn more details, but the first one has been announced to be in Stuart, FL March 5 – 9, with the boat show portion running 7th – 9th. 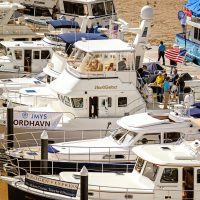 It is equally fun seeing familiar trawlerites faces and meeting new people – this is a great opportunity to spend quality time with people whom you have been emailing and calling. The JMYS team arrived in full force. On the sales side we had Jeff and Pam Merrill, Christopher and Alexandra Bruce along with Rob Piwowarczyk. Don Allen and Claudia Ortali from the JMYS technology side were also on hand. 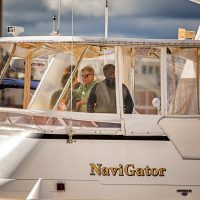 Jeff and Christopher were primarily on board to show off NaviGator. 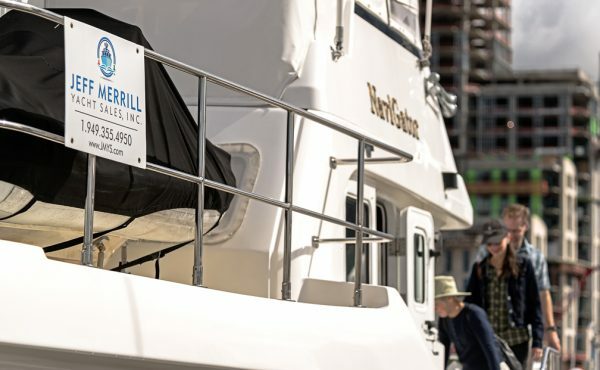 Rob who is also a licensed yacht broker helped out on the 47 as well as working in the tents to promote his new venture “The Trawler Experience”. 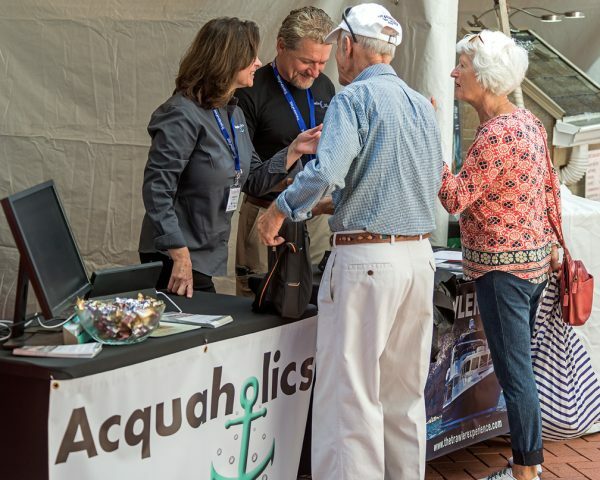 Don and Claudia shared a booth with Rob to announce their new web-based business, “Acquaholics”. You can read more about both of these businesses below. We all got together after hours to enjoy each other’s company. The down side of giving non-stop tours was that our team did not get much of an opportunity to see the other trawlers on display and some of the real cool boats we missed out on that also had long lines were: Grand Banks 60, Kadey-Krogen 50, Northern Marine 57, Henriques 52, North Pacific 49 and Hylas 44 and many others. (See below for an inventory summary of trawlers that were on display). The JMYS team met a lot of great people at the event. 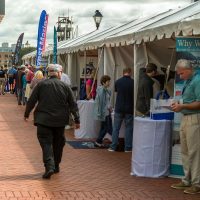 This is particularly encouraging for our segment of the cruising market that is all about trawlers as there are people who are just finding out about the trawler lifestyle and others who have been doing their home work for years and are now getting closer to the reality of boat ownership. With the healthy economy (a record high for the Dow Jones stock market average was set in the early days of October shortly after the event) there are a lot of people who have realized that cruising on the water and operating your own boat (whether it is a Great Loop adventure or an overseas expedition) is a fantastic way to enjoy your golden years. 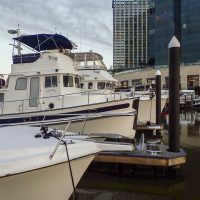 The docks are clean and wide, stable and can accommodate a large influx. We arrived early for set up on NaviGator and after tying up and having the cleaners on board (Thanks Tom!) we hung up our signs and then got organized for the show. 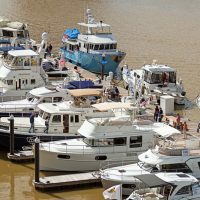 The “Boat Show” portion runs Thursday, Friday and Saturday and is normally the case, the weekdays were not as crowded, and we were able to spend more time with people. Saturday was a mob scene, but it was a lot of fun and when 5 O’clock arrived -somewhere was now / here – and we toasted a busy week. The Cruisers Roundtable was held on Friday afternoon and includes an experienced panel of veteran cruisers. Jeff again resumed his role as moderator and encouraged the audience to ask questions and seek advice. The panel as seated from left to right is: Jeff Merrill, Dylan Bailey, John Clayman, Bruce Kessler, Steve Zimmerman, Eric Kunz and Chris Parker. There were some lively discussions as always with good input from Eric on what is happening in navigation, Chris on the weather and Dylan on what surveyors see. 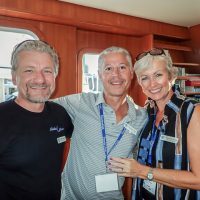 Jeff, John and Steve talked about boat design and brokerage and Bruce tied it all together with some stories from thousands of miles at sea. Also in the room were PassageMakers’ Jonathan Cooper, Andy Howe and Peter Swanson who provided additional insights. 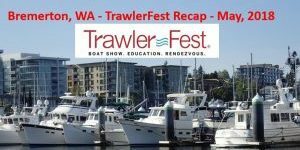 This is a fun regular TrawlerFest featured event and since it is unscripted it can get quite entertaining. Saturday was a big day in the classroom for JMYS. 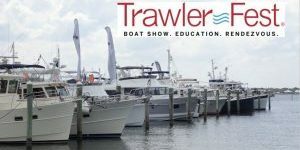 Jeff had a morning session to present “Dialing-In-Your-Trawler” which is always a fun seminar filled with dozens of ideas that can improve any trawler. Jeff had to wrap up in time and turn over the classroom to Christopher and Alexandra who shared “Cruisers Perspectives”. 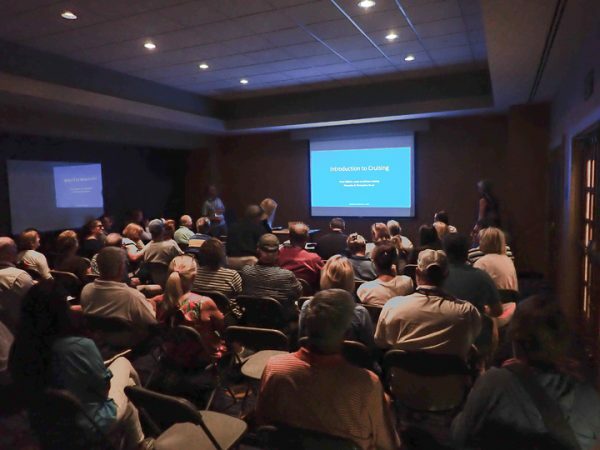 Hands down, this was the most popular seminar of the entire TrawlerFest with every seat filled and standing room only in the back. Very gratifying for the Bruce’s to share how they got started and fell in love with the lifestyle – and very encouraging for a lot of the people in the audience who have been wondering if this is something they can do (the answer is YES!). The last seminar of the day is a long 3-hour session that Jeff ran called “Offshore Essentials”. 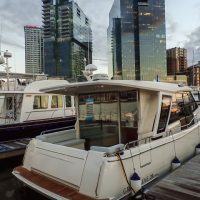 This course is for more experienced cruisers who are ready to travel non-stop for days and want to learn more about engine room checks, standing watch, preparing crew, operating navigation equipment, etc. The PowerPoint presentations for all three talks (including handouts from Jeff’s courses) are posted below and will be available for a limited time so feel free to download and review if you were in class or to check them out if you are interested in seeing what you missed. For those students who attended Jeff’s talks and/or Christopher and Alexandra’s seminar in Baltimore you are invited to review the presentations and handouts posted here for a limited time. These resources will be online for downloading until the end of November and then be removed. Please review them while they are “live”. Reminder: In addition to our trawlers for sale listings, JMYS also has a series TrawlerSkills videos for you to view on our YouTube channel. 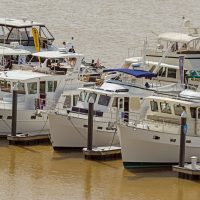 Topics include our “Physics of Docking” series as well as many owner operator hands-on learning techniques. 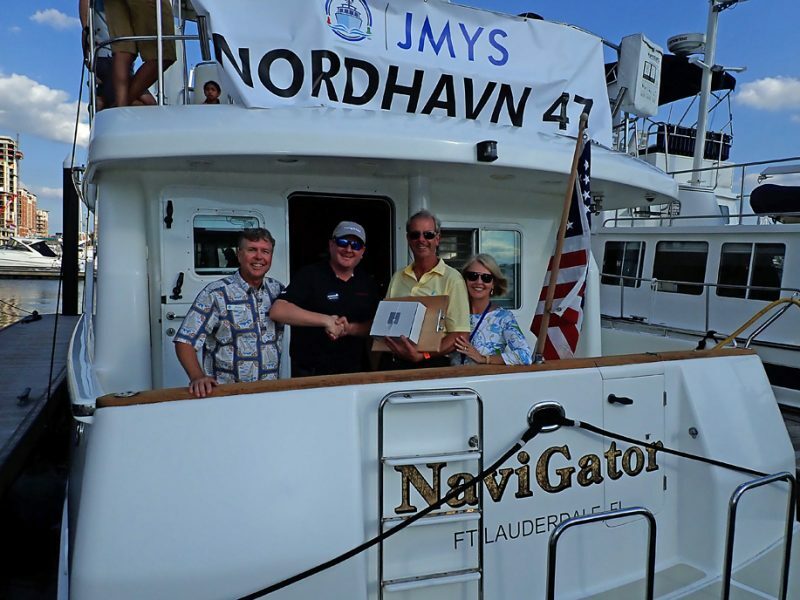 You can subscribe to our expanding YouTube Channel to get notifications when new videos are posted, and you can all sign up for the JMYS email newsletter list to receive announcements and keep informed about trawler events and activities. Thanks to everyone who stopped by or attended our seminars in Baltimore, we hope to keep in touch! 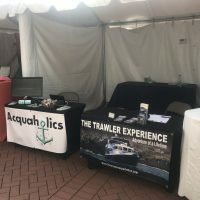 About Acquaholics: Baltimore TrawlerFest was the initial showcase to share the recently launched website (www.acquaholics.com) and they received positive feedback from guests and yacht owners. 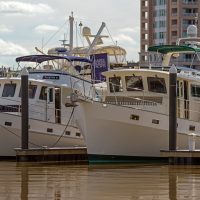 The news generated a lot of excitement as various yacht owners felt new revenue opportunities were available to them and for guests the opportunity to experience something different and unique. The website is free to use for all yacht owners and guests. 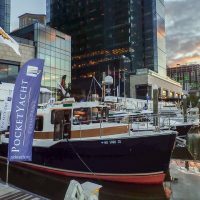 The site provides yacht owners with the ability to list their yacht for sleep aboard and/or invite passengers and/or crew on a journey. 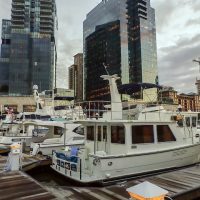 Providing guests with the ability to sleep aboard while docked, moored, on the hook (You also have the option to indicate if they are able to charter). Providing guests or crew with the ability to join you on a journey. Indicate purpose of the journey: pleasure, exploration, repositioning, research or education/training. Identify roles needed. E.g. Captain, Chef, Deckhand, Diver, Videographer, Watch Stander, etc. or simply a passenger with no experience. Specify fee (or if they pay for e.g. Food/Fuel in lieu of a fee) or compensation provided if you are recruiting crew or free if that is your preference. 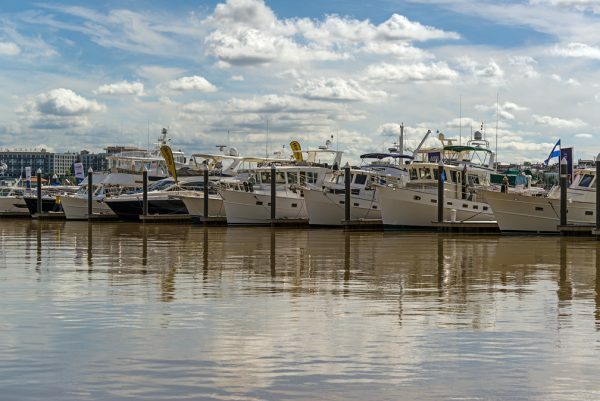 Guests have the ability to filter their search using the extensive search filters provided such as pets onboard, boat name, boat type and over 100 amenities, etc. You can contact Acquaholics at info@acquaholics.com. Feel free to reach out with any questions, feedback or partnering opportunities. 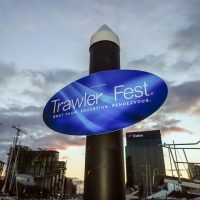 Rob Piwowarczyk, owner of Bella Luna Charter out of Southern California introduced their new educational charter – The Trawler Experience, geared towards first time trawler buyers. 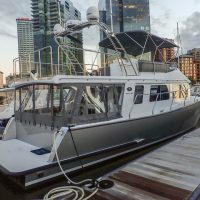 These one day or overnight charters offer future trawler owners the opportunity to – “Try it before you buy it”. 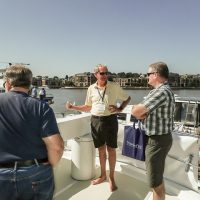 Guests are able to get real life, hands on experience onboard a Selene 55 Ocean Trawler. 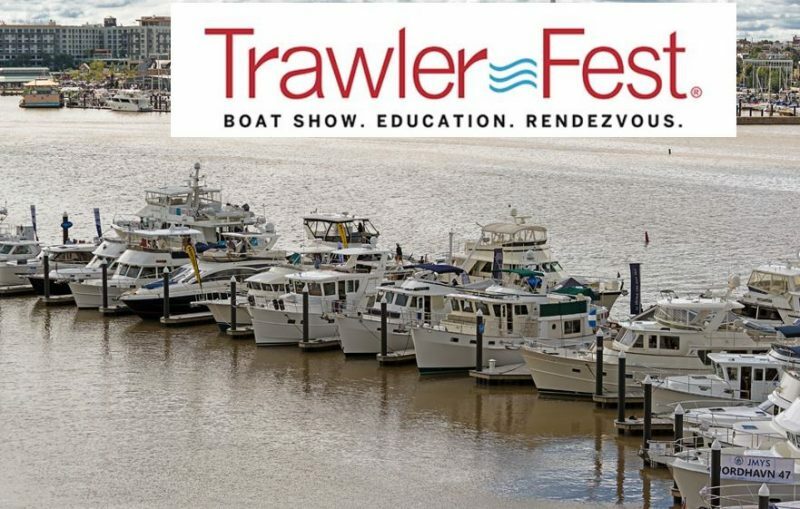 Rob and his wife Deanna are live aboard trawler owners that love the trawler cruising lifestyle and want to share their trawler owner experience with future trawler owners and help them make a better buying decision. 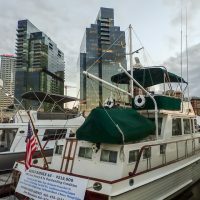 Below is an alphabetical summary list of the new and used trawlers that were on display.